First reported from Britain by Eversham and Collier (1997) from specimens collected in Essex in 1995, this species is now widespread in the southeast occuring on sandy or gravelly soils in open situations (Luff, 2007). Adults occur mostly between May and August and are spring breeders. 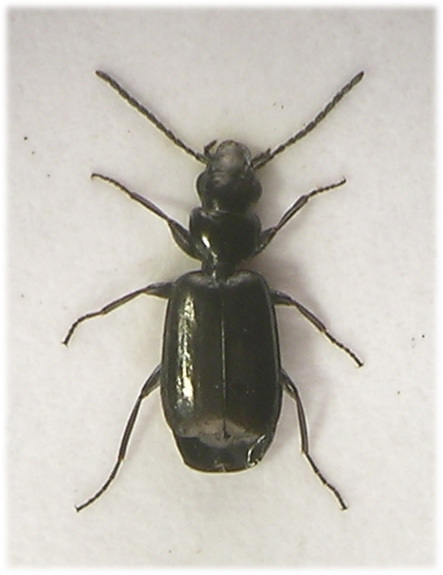 The species appears to be scarce locally; between 2006 and 2008 our only Watford record is from Cassiobury park during February 2006 when several adults were extracted from a grass and moss sample taken from around decaying Salix logs. When first recording these small carabids many may seem very similar, mostly because of their size and dark colouration, but with a little experience members of Syntomus and microlestes may be recognised in the field with a X10 lens. 2.8-3.7mm (Luff, 2007). Entirely shining with a faint metallic reflection, somewhat convex, most noticeable at humeral angles and elytral margins. Head with fine microsculpture and very fine and sparse puncturation, obscurely transversely impressed near front margin of eyes. Eyes large and prominent, temples weakly constricted. Palpi black, terminal segment of maxillary palps well developed and rufinistic towards apex. Antennae black, pubescent from third segment. Two setiferous punctures beside each eye. Pronotum finely microsculptured and very finely and sparsely punctured, central longitudinal furrow weak. Widest behind rounded front angles, weakly curved and constricted to well developed and sharp hind angles which are in line with the base of the pronotum (Syntomus). Impressed inside hind angles but without distinct fovea. 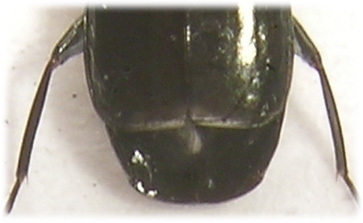 Elytra black and very finely microsculptured, striae either not visible or present towards base and near suture as obscure series of fine punctures. Dorsal punctures absent or barely suggested but with a distinct large puncture either side of apex of scutellum. Shoulders rounded and lateral margins bordered, widest in apical third. Apex truncate leaving apical abdominal tergite(s) exposed. Legs dark with meso and metatibiae and all tarsi lighter. Protibiae strongly notched inside before apex. Tarsi without lobed segments. Claws finely denticulate. Description taken from one Watford specimen examined at X40. Eversham, B. and Collier, M. 1997 Microlestes minutulus (Goeze) new to Britain. Coleopterist 5:93-94.